The current flooding on the Niobrara River below Spencer Dam and near the town of Niobrara should have no significant impact on the trips we offer upriver near Valentine. Our thoughts and prayers are with the individuals whose lives are impacted by this catastrophic event. TUBING TRIPS - OUR MOST POPULAR OPTION! 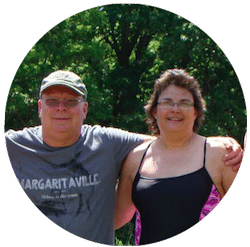 Our tubing trips keep our customers coming back year after year! Choose between a four hour trip from Berry Bridge to Brewer Bridge or a five and a half hour trip taking you from Berry Bridge to Penbrook Landing. On our Niobrara tubing trips you’ll drift down the slow-flowing river on a giant inflatable tube. You will be hooked up to your friends and family, allowing you to enjoy this wonderful experience together! Take your time to enjoy the Niobrara River and its beautiful surroundings, including an opportunity to visit to Nebraska’s tallest waterfall, the magnificent Smith Falls! 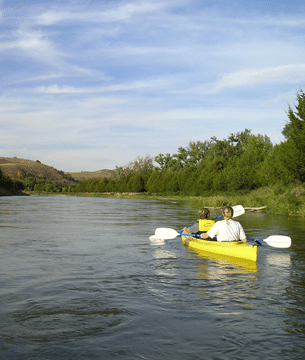 Come and enjoy paddling through the scenic wilderness of Nebraska’s Niobrara River. Here at Little Outlaw, we have both single and tandem kayaks as well as double seater canoes available for you! 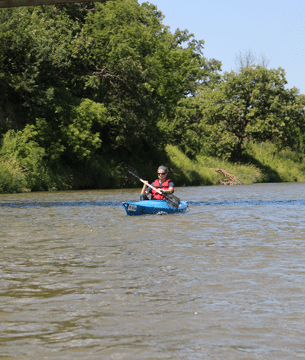 The Niobrara river is slow-flowing and calm, with typical current speeds of three to seven miles per hour, making it perfect for kayakers and canoers of all experience levels to enjoy. We pride ourselves on our top of the line equipment and guarantee that you’ll have a quality kayak or canoe for your trip! All kayak and canoe trips offer a free shuttle service to the start point which means that after you have made your way down the river you will finish at the same location where you left your vehicle. 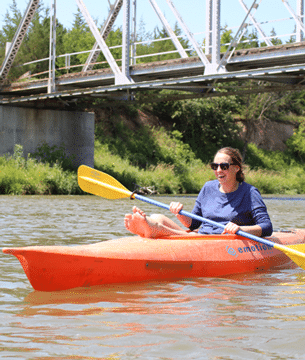 Are you looking to get out and experience the Niobrara River without having to get wet? Join us on one of our fun stock tank trips which go out from Memorial Day through Labor Day. Take a four person stock tank to get out on the river and enjoy its beautiful surroundings. Our tanks are equipped with comfortable chairs, so bring your cooler and snacks along with you! You’ll have the opportunity to visit Nebraska’s tallest waterfall, the incredible Smith Falls. Don’t forget that at least one person in your group will need to be ready to get out and tow your tank to shore at the end of your trip! We’re a small, Nebraskan family business with over 35 years experience on the Niobrara River. We built Little Outlaw to give you the chance to explore the place we call home and we’re sure that you’re going to love it as much as we do! Whether you choose to paddle on one of our kayak and canoe trips, float down on an inflatable tube, or experience this beautiful river on one of our stock tank trips we’re certain you’ll leave wanting more! We’re proud to be a licensed outfitter on the Niobrara River offering top quality equipment to our visitors. Our passion and friendly service keep our customers coming back year after year. So what are you waiting for? 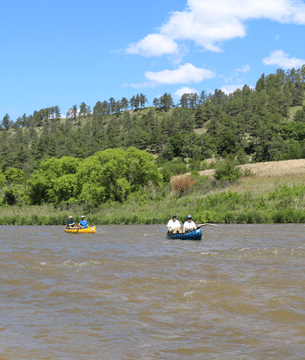 Join us for a memorable floating trip down the Niobrara River. I drove four hours to kayak on the Niobrara. The night before we were to get on the river, a terrible storm hit Valentine dumping inches of rain. By early afternoon, things were looking much better, so we met him at the river, had a wonderful afternoon kayaking, and returned safe and sound. I highly recommend Little Outlaw for their concern about safety as well as courteous service. One of the best Outfitters in the business. Knowledgeable, friendly staff and good equipment! Come and enjoy one of Nebraska's hidden treasure. Designated as a "Wild and Scenic River" the stretch near Valentine has beautiful scenery, spectacular waterfalls and great water to canoe, tube, tank or kayak. These guys are great and will provide you with great service. We so appreciate all you do for our group, large or small, over all these years. You are really the best outfitter in Valentine! This has become an annual trip for me and my friends and family. And you and your crew are always so friendly, happy, but most of all FUN! We look forward to this trip and to seeing you every year! Thanks for all that you guys do!